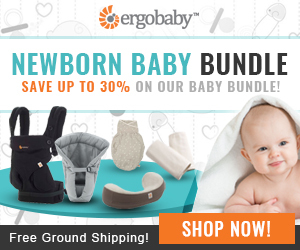 Disclosure: Affiliate links are used in this post, but all thoughts and opinions are my own. Read my full disclosure here. Since today is our 5 year anniversary, I thought it would be perfect to flash back to our Harry Potter themed wedding! 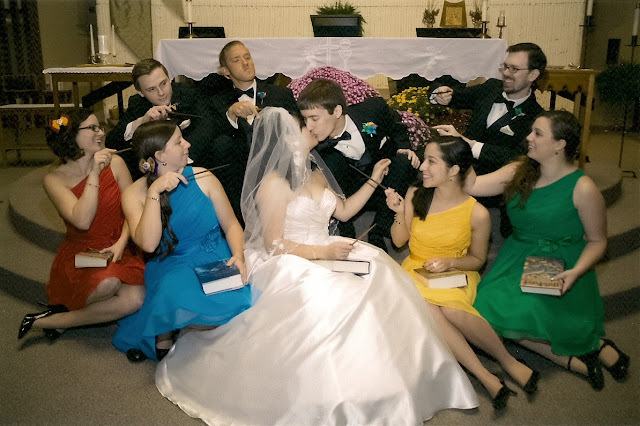 Yes, that's right, I was able to convince my husband into having a Harry Potter themed wedding. It was one the best days of our lives. 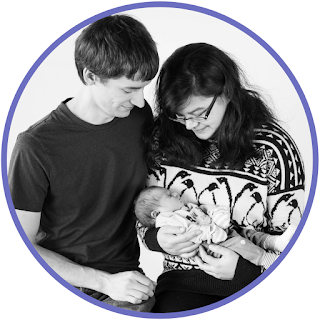 The birth of our daughter, of course, trumps it now, but the wedding is definitely second on the list! 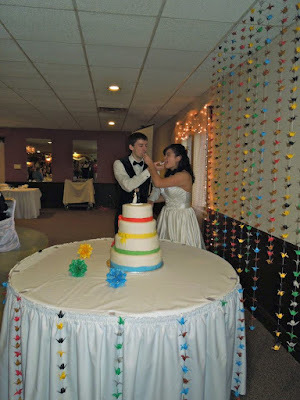 We were fortunate enough to have parents that were able to help pay for our wedding, but even so we had a budget to stick to and did a lot of the decorations ourselves! 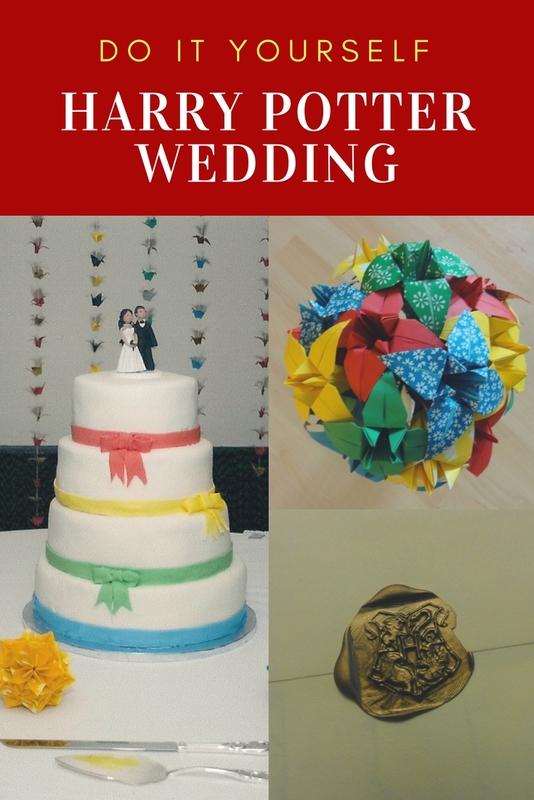 Here is a list of what we had done ourselves and if you scroll to the bottom, you will find more photos of our wedding! 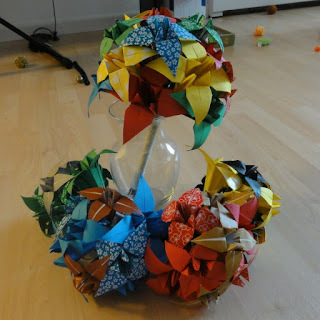 Flowers are on the most expensive items for a wedding, so we chose to skip real flowers and make our own origami ones! Luckily, my favorite flower is the lily, and origami lilies are super easy to make! All you need is some paper, floral wire, floral tape, and some ribbon. 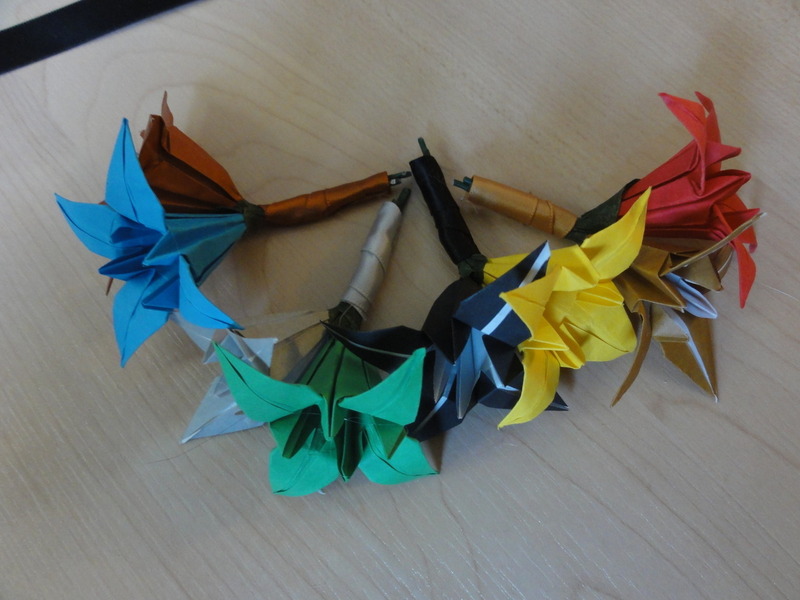 You make the origami lilies, which you can find a pattern for here, then attach them to the wire with the tape. You then wrap a bunch of stems together using the ribbon and your bouquet is complete! 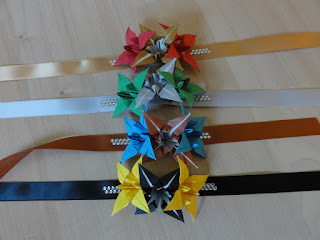 You can either tie the ribbon so you have a bow or you can use hot glue at the end. Below you can see my finished bouquet and the bridesmaid's bouquets. We used the main Hogwarts house colors primarily for our wedding (red, yellow, green blue) and then did the secondary colors as accents (gold, black, silver, and bronze). 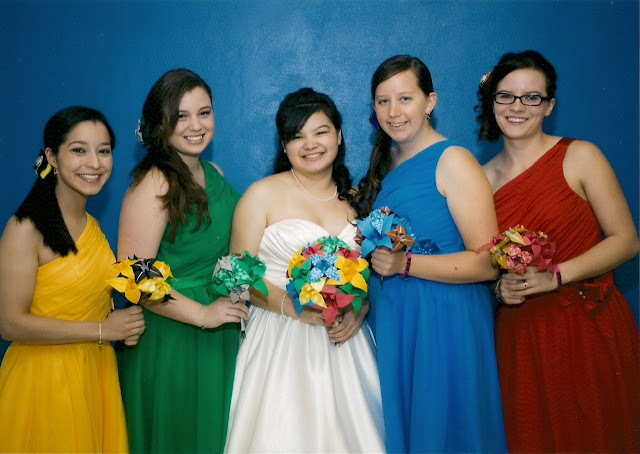 As you can see the bridesmaids each represented a different Hogwarts house (Gryffindor, Hufflepuff, Slytherin, Ravenclaw)! Like the bouquets above, I made origami lilies for these as well, but on a smaller scale. 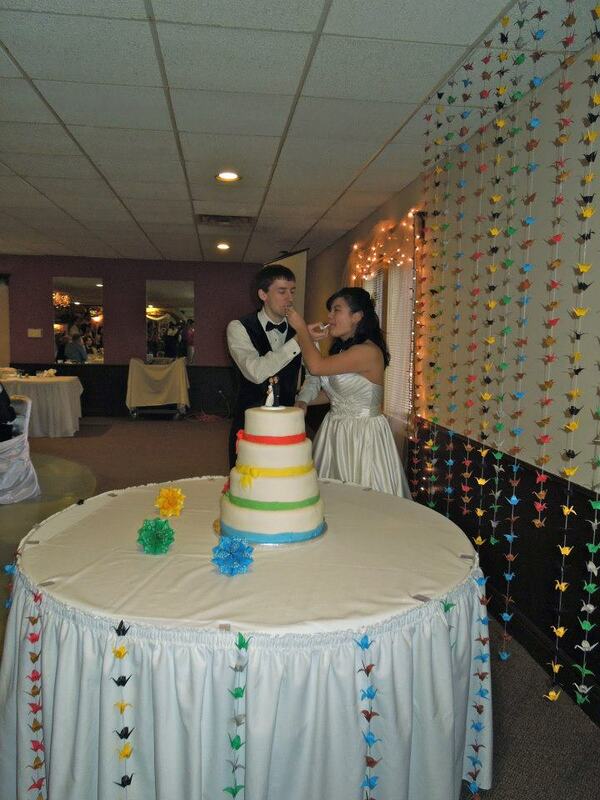 The boutonnieres were done the same way as the bouquets except smaller, each only had two flowers. The corsages were done a little differently. For the corsages, I made three lilies for each, cut off the pointed bottoms, and then hot glued them to ribbon. I used sticker gems to add a little bling. 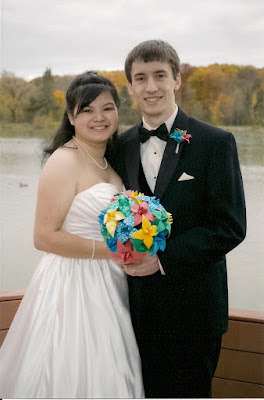 I made sure the ribbon was extra long so they would fit anyone's hand and brought scissors with on the day of our wedding so people could cut off the extra length if they didn't want a huge bow. I made Kusudama balls and then glued them to ribbon so they would hang off the church pews. You can find a tutorial on how to make Kusudama balls here. 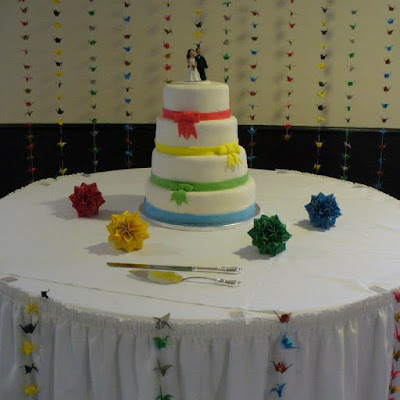 I had also made some extra to decorate the cake table. You can find my tutorial for making wands here! These were so much fun to make and a huge hit at the wedding! They made great photo props! We had kept a few and so I even used them as a prop in some baby photos. 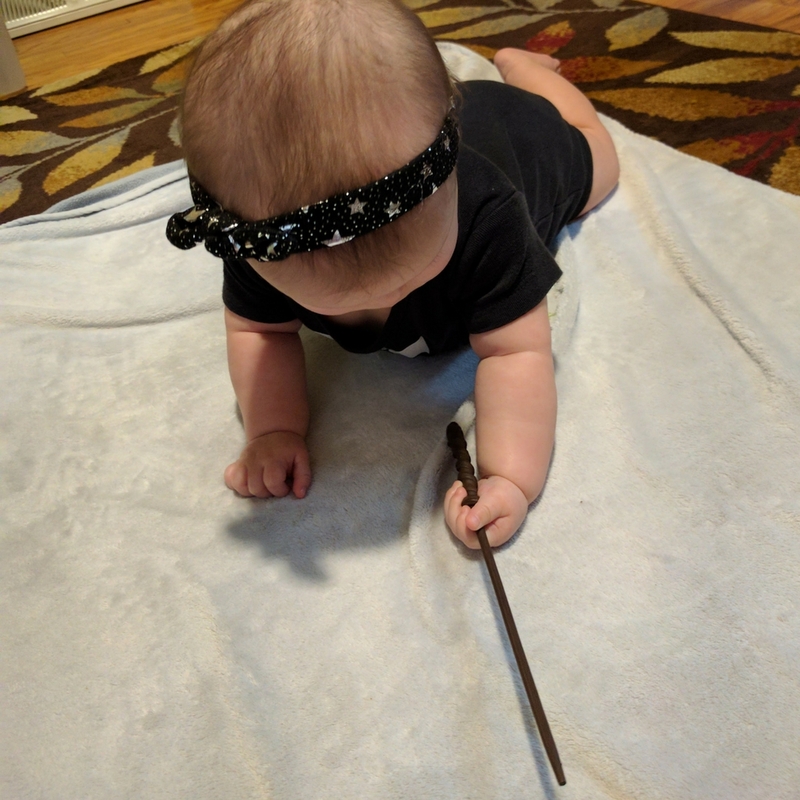 However, I would be extremely careful when using the wands as a baby prop or use them during the newborn stage as baby won't be able to grab them and move much. I think I waited too late, so I had to make sure our daughter didn't put it in her mouth or poke her eye out when I did photos. I had managed to find Harry Potter themed 3D paper owl templates on line! I printed and made a ton of these. I then typed up everyone's names, printed them out on paper, cut them out, and glued them to the owl's feet! Unfortunately it looks like 3EyedBear no longer offers the Harry Potter colors, but they have other cute owl colors, some that are more natural, so could still work for a Harry Potter themed wedding. 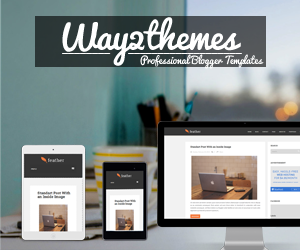 Otherwise you may to have to contact them to see if you can get the templates I used. If you aren't doing assigned seating, these would still be cute for decor! Since we did assigned seating, I chose to label the tables after places in Harry Potter. The bridesmaid's table was Beauxbatons, groomsmen were Durmstrang, and our table was Hogwarts. The guests sat at a variety of locations, such as Hogsmeade, 4 Private Drive, Diagon Alley, etc. To cut costs we skipped sending Save The Dates and just sent wedding invitations, which I had made. I also made our Thank You cards as well. 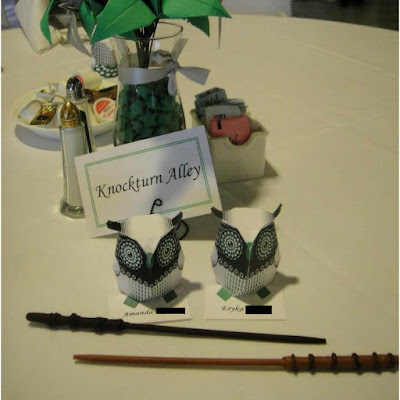 At our bridal shower, we had gotten a Harry Potter wax seal kit, which I used to seal the Thank You cards I sent out. I wish I had gotten some sooner to use on the wedding invites as well as the results were pretty cool! 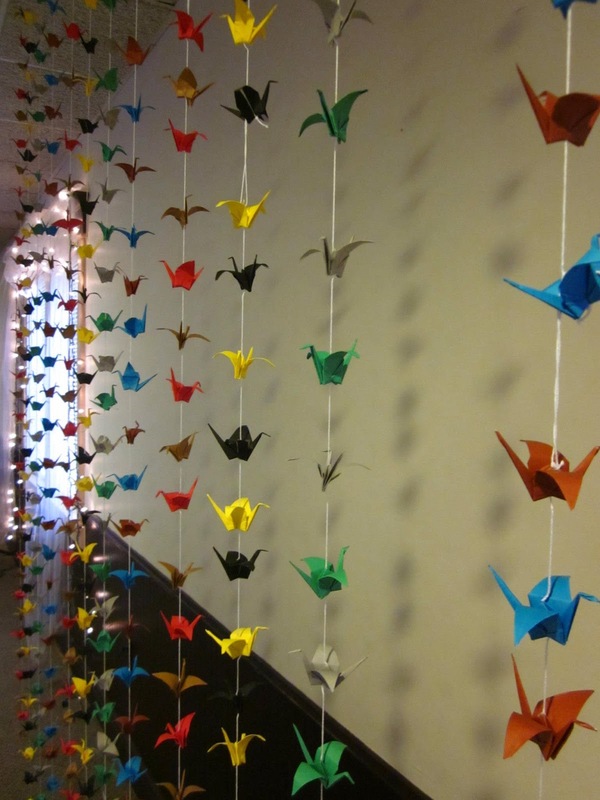 Being half Chinese, I wanted something from my Asian culture at the wedding, and in the Asian culture, there is a tradition that anyone who folds 1,000 cranes will be granted a wish (source). 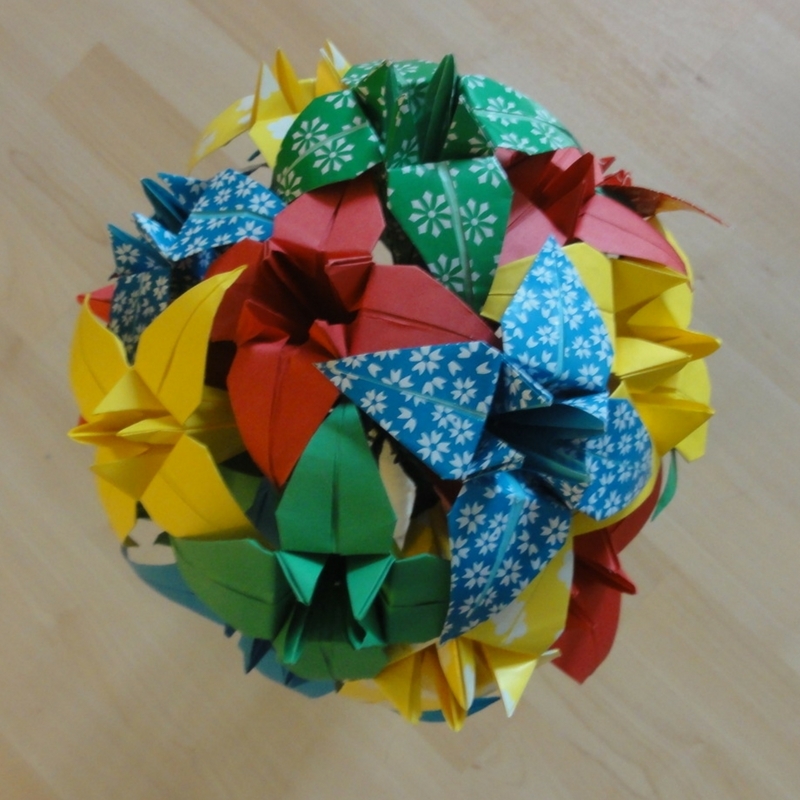 I ended up making 988 cranes, while my husband only made 12! We strung the cranes on a string and used them as various backdrops. We had so many, we ended up decorating the cake table and guest book table with them as well! You can find a tutorial on how to make them here. 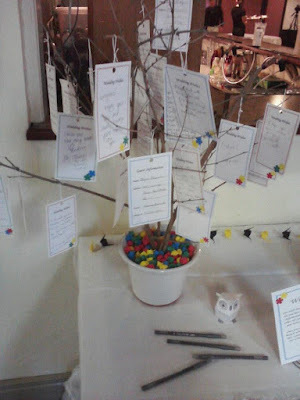 We wanted something more unique and fun than just a boring guest book, so we chose to do a wish tree! This was really simple to make. All you need is some sticks, river rocks, and a pot. 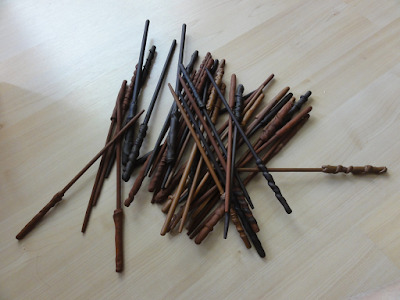 We picked out some fun looking sticks, bunched them together and set them in the pot, you will have to hold them. Then pour in some river rocks around the sticks till you have enough that they don't move out of the position you want. For the wish cards, I made a template in Microsoft Word and printed them out on 4x6 note cards, then used a hole punch to punch a hole at the top so I could run some string through. On one side people could write whatever wedding wishes they wanted for us and on the other side I had made a contact info page so we could get addresses for sending out Thank You's. 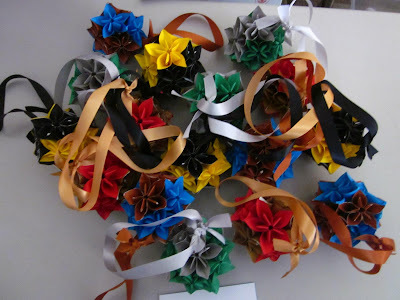 I made a bunch of cute paper stars to use as vase fillers. I also used them to cover up the rocks on our wish tree, which you can see in the photo above. You can find a tutorial to make your own lucky stars here. Those are just some ideas on what you can do yourself to cut down on wedding costs and how you can throw your own Harry Potter theme wedding! Now for what most of you are probably looking forward to, here are some more photos from our wedding! I had asked the bridesmaids to bring their favorite Harry Potter book! I have a confession: I've never seen Harry Potter. Yeah, yeah...I know. 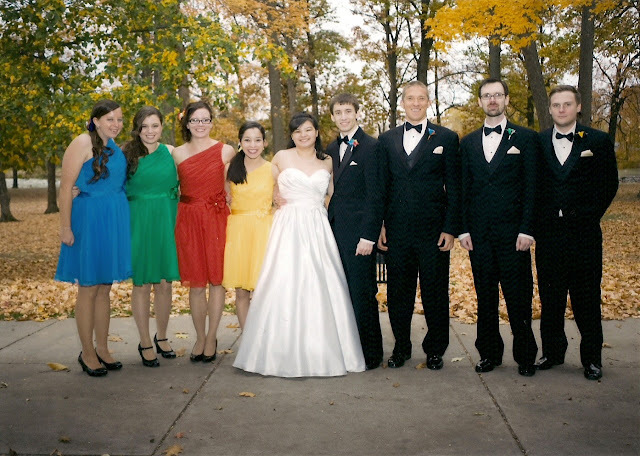 This wedding is adorable, though! Thank you! You should totally read or watch it some time! This is so amazing! I love everything about it. 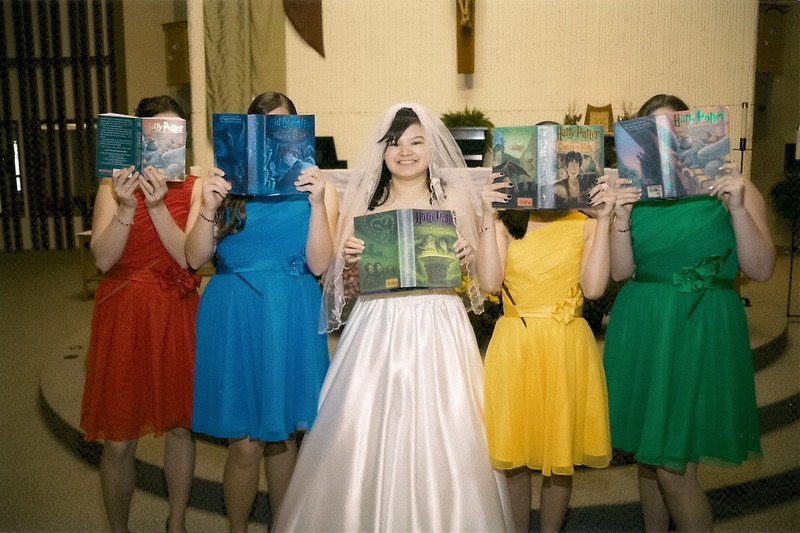 The bridesmaid dresses, perfect!, the invitations with the Hogwarts stamp. LOVE IT! He tried to help, lol! Thank you! Looks like such a fun wedding! My husband and I love Harry Potter as well. Absolutely LOVE this idea and how it came together! So unique. Harry Potter is one of my favorite things, so if I could have talked my husband into doing this we totally would have! loved the pics and enthusiasm of all those who participated in making it the most memorable one. That Hogwarts wax seal on the invitations is such a nice touch, and I LOVE all of the origami!! 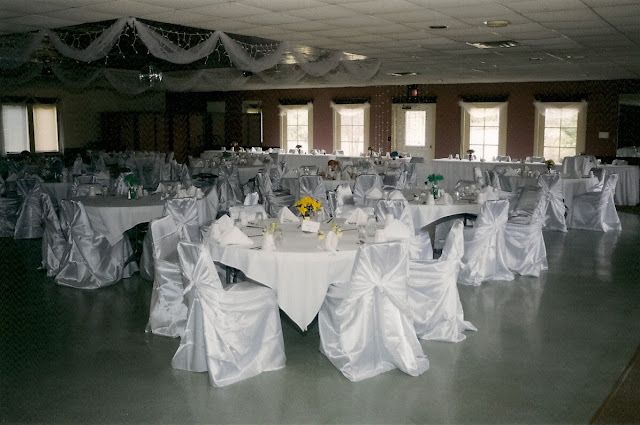 This is a cool theme for a wedding. 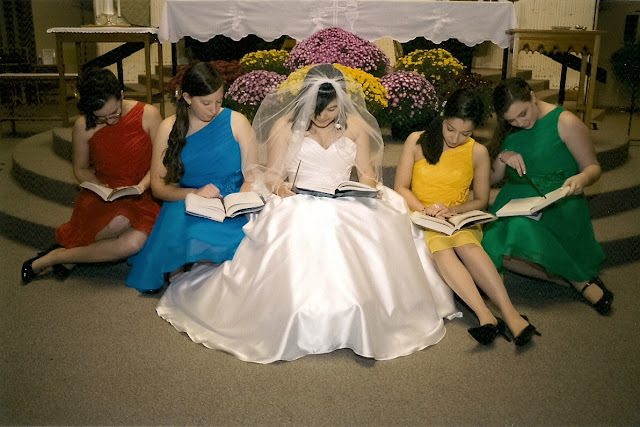 I love those colorful dresses of the bridesmaid such a a very creativideas for a once in a lifetime memories. 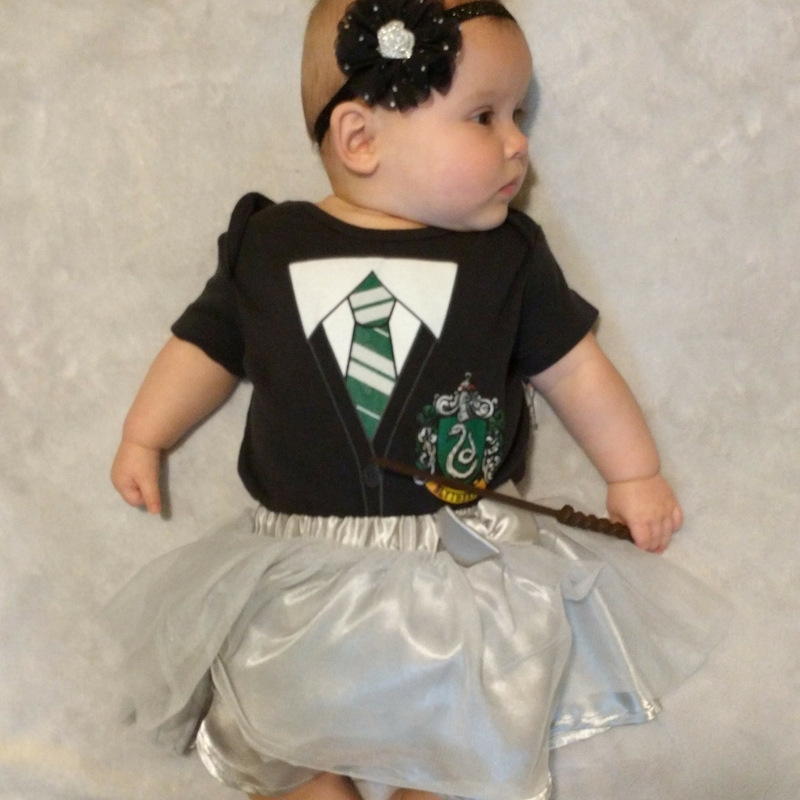 Aw, this is so amazing and magical! You look so stunning your dress!